in reference to bolstering a learning program. To start the microlearning discussion we must first define what it is. 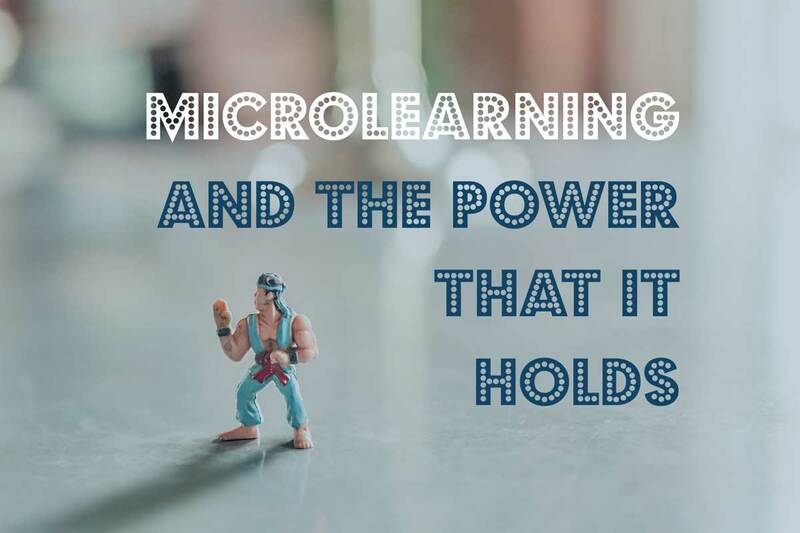 Microlearning is a brief (less than 5 minute) learning component with a focus on a very particular learning object (specifically a skill, behavior, or compliance piece). This could be applicable to topics that do not need the granularity of a full course, or can be used as a supplement to learning exercises throughout a student’s learning within an organization. The concept of Microlearning is not that new. However, with the migration of learnings to more accessible on the go mobile learning (mLearning) platforms such as phones and tablets, their need becomes a bit more noticeable. Picture if you will an eLearning that takes an hour of your employees’ time. Users have to watch it, then they have to answer some questions, then they have to click a couple things. But the topic of the learning is something exceedingly simple that is only being conveyed to the user for a compliance issue. In the business world the old adage “Time is money” still rings true through today. Now, imagine you can achieve the same certification results in under 5 minutes, using a learning that is not only engaging but entirely focused. The shorter learning will not only be better for the organization as a whole, but it will also allow for a higher completion percentage and adheres to our multi-focused daily life. Where our multitasking is so engrained in a workflow that we cannot allow more than 5 minutes on any given task before needing to refocus on a bigger picture. Wait, it appeals to shortened attention spans and works great with our hustling staff who is constantly on the go? Why aren’t we doing this already? What’s the catch? Microlearning is not designed to be the end all be all form of learning that people may wish for it to be. It has been slowly established and vetted as a credible offering, with some adverse perceptions causing for a slow adoption. It is, however, a means to augment your current offerings, as well as further the reach of content which may be underutilized or unnecessarily complex. Because they’re so brief, microlearnings are quick to make, implement, and can be a real game changer for your training courses if implemented correctly. So how can we ensure great microlearnings? In order to address the need for a microlearning, refer to the following: As referenced throughout this post, one must evaluate the learning needs they wish to address with the microlearning. Is it something that lacks the complexity to warrant an entire eLearning? Can a student master the content in a single sitting? Are you yourself as an instructional designer capable of ripping out the fluff and unnecessary components in order to optimize the microlearning? Microlearnings need to be concise in order to be effective. The moment the content becomes tainted with alternative concepts or distractions from the general topic, the effectiveness deteriorates sort of like a sidebar conversation you would have with one of your co-workers without the benefit of an immediate follow-up communication to serve as a reminder. As such, microlearnings must also be repeatable. When you implement a microlearning into your learning environment, ensure that the user is required to take it in an acceptable window that will focus them on the skills, compliance, or potential behavior that you are attempting to introduce. In order to capitalize on the short attention span of your learners, the content must be created in a platform that will be accessible for mLearning. You may have the greatest microlearning in the world, but if it is required to solely be taken on a laptop or desktop, it will quickly be muddled in a sea of tabs and alternative work related processes. How do I know if my microlearnings are working? Because they’re so short and the topics are so specific, this would be a great time to survey a small portion of your user base. Those familiar with the previous cumbersome courses will beam a ray of positivity to the training. You will also most noticeably recognize a higher completion rate over a shorter period of time because it is a lot easier to make time for something as brief as a microlearning. As the formation of a microlearning is so new and a relatively inexact science, be sure to enlist feedback on how to possibly make the learnings more potent. As well as ways to convey a clearer message on the chosen subjects you are planning to implement. If you are already implementing microlearnings in your course curriculum and training, be sure to reach out and tell us how they’re doing. We’d love to hear from you on your success stories, and ways in which we can further promote this interesting new(ish) concept. Also, any feedback on our social media pages would be much appreciated, as to whether you would wish us to further explore this exciting topic.